Relax, restore and heal with Zenko Yoga in Hawaii! How do five days of yoga, meditation, massage and sitting by the pool sound? How does self reflection, relaxing, restoring and exploring sound? How does all of the above, combined with the breathtaking beauty of Hawaii and your Zenko Yoga tribe sound? 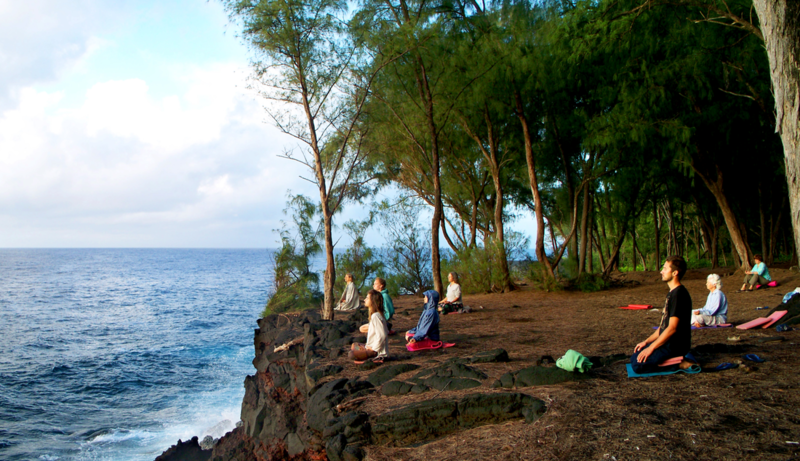 Zenko Yoga is thrilled to host this Life Changing International Retreat nowhere else than the big island of Hawaii. Join us on 14th May 2018, for this 5 day Zenko Yoga Retreat to soothe the soul and nourish your whole being. Take time out with the Zenko Tribe, as teachers Lauren Vercoe and Mandy Habener guide you on this breathtaking journey to self reflection and discovery. With a combined twelve years of experience in yoga, meditation and mindfulness, you will be supported and guided to delve deeper into your practice and into yourself. Enjoy a variety of dynamic power flow, gentle restorative and yoga nidra specifically designed to balance the body and mind and to open the heart. Restore with us at the Hawaii Island Retreat Centre located on 50 acres of lush gardens, wild groves and ancient valley trails with beautiful views to the ocean. Choose from single or twin share accomodation, giving you a chance to meet and bond with like-minded Zenko yogis while being surrounded by all the beauty this retreat centre has to offer. Sit back and enjoy the salt water infinity swimming pool, lapping up the serenity that surrounds you. Delight in our own exclusive yoga studio located at the resort where you will enjoy daily yoga and meditation as well as mindfulness techniques and tools to take home with you. Two delicious organic meals will be prepared daily on site especially for our group. All produce is either grown on the property or sourced locally. You can choose your own lunch (at your cost) while exploring the small northern coastal towns of Hawi and Kapaau. ​You’ll have plenty of free time to relax, unwind, explore and enjoy your surroundings whilst on retreat. Choose from spa treatments, shopping, nature walks, water sports and island exploring. Meet at 2pm on Monday 14th May and finish at 11am on Saturday 19th May. Many of our retreaters organise flights a few days early or later to maximise their time on vacation. We have carefully chosen dates to offer the opportunity for people to explore before or after, in addition to their retreat experience. For further information, please call 1300 69 69 21. Early Bird Booking - First 10 Spots ONLY! Escape to Hawaii and immerse yourself amongst the loving and nurturing Zenko community of likeminded souls. Tick this off your bucket list now! A non refundable deposit of $500 is required to secure your place. Full payment required by 31st December 2017. Cancellation up until 14th February 2018 - 50% of balance payments refunded.